Sign went up today, don't know if/when it's open. Sign says: Fruit, Vegetables, Cold cuts, Wines and Cheeses, Bakery, Gourmet Products. Phone number and drawing of the van presumably indicate delivery available. When I spoke to hi right after he left superlake, he said he hoped by the 15th of Dec. He night already be open. I do not know. I shall have to check. I hope it goes well for him. Is he located near El Barco? SunFan wrote: Is he located near El Barco? See picture of sign in previous post: bottom line gives exact location. Ah my failing eyes and low res screen. 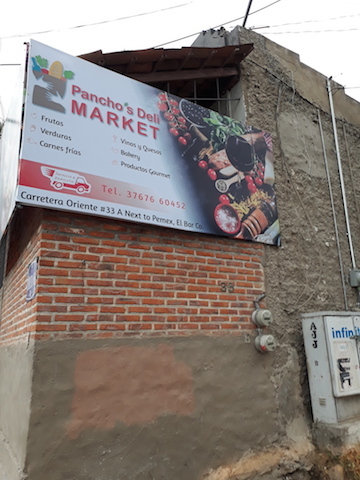 I went by Pancho's store this morning. They were still stacking the shelves. The work was being done beautifully. I was the only customer there. The place looked very nice. And the products were very nicely displayed, So far so good. I am looking forward to see how the store does once it is totally full of products. So far it looks great. I hope he will be a success. I see Pancho is building a ramp for the disabled to get into his store. He certainly listens to his customers.